BYU Honor Code Office: What is the process for obtaining a beard exception? What is that process? Well, to start, collegians-- non-discriminatorily, they do not specify male or female-- you must get a physician involved to sport a beard at BYU. For those who aren't aware, Brigham Young University (BYU) is a large Mormon institution in Utah -- one of the most Republican states in the USA. You know what's coming, right? This is a photograph of Mormon leader Brigham Young, after whom the University is named. 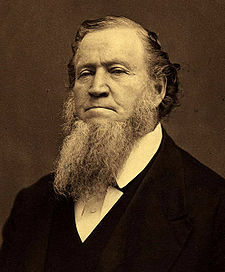 Brigham Young Image from Wikipedia. Maybe Brigham couldn't wrangle the mustache rider to the beard exception. By the way, Mr. Young had about 55 wives.